The E92 335i has become the BMW to tune. It has become synonymous with making big horsepower with relatively easy modifications. There have been countless N54 Powered project cars built all over the world. Our E92 335i came to us back in early 2007 soon after the E92 chassis was introduced to the US market. We were extremely excited to be the first North American tuner to begin research and development on the new twin turbo inline six three liter engine. The N54 remains one of the most sought after engines to tune and rightfully so. It makes usable power at nearly all RPMs from the moment you dip into the throttle. Our goal with this was to open up the powerband even further to unleash everything this engine has to offer. We started with the obvious: intake and exhaust. aFe has reported gains of 27hp and 34 lbs/ft of torque with their intake alone! Towards the end of the combustion pathway, we started with a cat-less downpipe and replaced the stock cat back with Corsa's 3.5" system. This huge piping helps the turbos push out more exhaust gas and provides a noticeable power boost (amplified further with the intake). Extra breathing means extra heat, so we also installed a Cobb Intercooler. We strongly encourage any one of these mods individually, but with all of this new found power the car needs to think differently about air/fuel ratio and ignition timing. The Cobb Accessport is easy to use and the bang for the buck is incredible. With our mods and a tune, it is safe to expect at least a +85hp and +100lb/ft tq gain! We understand that the 335i owner is not necessarily a wannabe M3 owner, and vice versa. The 335i has outstanding balance right out of the box, with a lighter front end and playful handling. The goal is not to turn the 335i into a race car, but make it a generally more engaging street car. So for that ethos to show through, we moved on to suspension and handling. Let's get this out of the way... we wanted BMW to offer the 335i with an LSD to get the most traction out of the turns. Since that wasn't an option, we added our own. We went with the OS Giken TractionControl LSD unit, a progressive unit that is capable of 100% lockup. Making sure the dynamics are confidence inspiring to get all the power to the ground are Bilstein PSS10 coil overs. These coil overs provide 10 different compression and rebound settings so we could get the ride dialed in perfectly for the street or occasional track day. Aesthetically, we like clean simple lines of the coupe with minimal decoration. Subtle improvements here and there distinguish this from a regular E92. We added a Hartge front lip and black kidneys. It really turns into a refined beauty when you notice the jewelry at all four corners. Custom offset Forgeline wheels bring the visual stance a bit more width, while a minimal fender to wheel gap still allows full suspension travel. We rounded out the gorgeous stock interior with an integrated P3 gauge to keep track of all our temps and boost pressure. On the road, our already excellent N54 335i is transformed. The power builds earlier and more linear. Full torque punches in before 2500 rpm and the power never dies out because the horsepower rush carries the motor all the way to redline. It feels as if the motor has shed rotating mass, pulling harder and faster everywhere. The sound is inline-six-tastic. Where before it sounded muted, there is now a low rpm growl which turns into a smooth, yet aggressive roar at WOT. Diving into turns the car feels very stock, but flatter and with less roll. The heft of the hydraulic steering is welcome and we can tell we're able to access all of our power once past the apex much earlier than in pre-mod drives. The car has retained a refined, subtle, daily driver attitude that is completely livable and gets a lot of looks on the street. But simultaneously, we have emphasized the capabilities of this chassis and created a coupe that is far more competent than those costing tens of thousands more (*ahem* M3). * = FMIC does not add more horsepower but does a better job of maintaining increased boost levels for longer periods. Without it, the engine will not be able to make multiple consecutive runs at full boost and performance will suffer. * = FMIC and BOV do not add more horsepower on their own but they do a better job of maintaining increased boost levels for longer periods. Without them, the engine will not be able to make multiple consecutive runs at full boost and performance will suffer. If you do only one upgrade to your 335i it had better be this. This is your "all-in-one" programming tool for 335i performance upgrades. Not only can it flash your 335i ECU with new performance files but it also works as a diagnostic code reader, live data display, and data logger. The Cobb AP plugs into the car's OBD port in the footwell. You can choose to leave it plugged in and on the included cradle or unplug it after performing your software upgrade or diagnostic work. When plugged in the ultra clear display can show 6 additional gauge readings - pedal position, battery voltage, coolant temp, intake air temp, ignition timing, boost, and more. Performance maps are available for nearly all of the popular bolt-on upgrades for the 335i. See the tuning stages above for an idea of the tuning potential of the N54 with the Cobb AccessPort. This sealed cold air intake system is engineered to let maximum air in while keeping engine heat out. Featuring two uniquely shaped molded intake ducts that replaces the single stock intake tract, this intake system smoothly directs increased air flow for improved volumetric efficiency and maximum performance. So effective is the design that Intake Air Temperature (IAT) at normal running speeds is 11 degrees lower than the factory intake. Complementing the dual intake tract are two Dynamic Air Scoops (D.A.S.) that further direct air into the engine. Easily accessible with a satin black powdercoated aluminum cover, an washable/reusable conical air filter is enclosed in a molded plastic housing and mounted on a oval intake tube that smoothly supplies maximum air to the twin turbos. The full effect of this system cannot be felt or tested on stationary dyno and can only be fully appreciated on the wide open highway. By removing your stock intake air box, you are removing the most restrictive portion of your 335's intake system, increasing both horse power and torque, improving acceleration as well as throttle response. Direct more fresh cool air from your BMW's center/nose grills to your intake, with the aFe D.A.S. (Dynamic Air Scoops). These two "scoops" install behind your front grills to direct more airflow into the factory intake snorkel. These scoops are a direct bolt-in install, and include installation instructions and required hardware for a simple install. When combined with a higher flowing filter kit these scoops help get the maximum benefit of a higher efficiency filter by providing more cool, fresh outside air directly into the intake snorkel. Both the turbo models and the 4.0 V8 models especially need this added air flow for best horsepower and torque. All of the tuning in the world is only as good as the weakest link. More boost in your 135/335 is great! But you will soon learn that some of the factory hardware is not up to the task of handling that extra pressure. One of the first things to fail and cause a boost leak are the factory boost diverter valves. 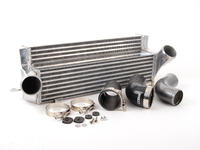 This allows boost to "leak" out of the intake stream and a loss of power from the engine. This ECS Tuning chargepipe upgrade includes a blow-off valve in place of the factory diverter valves. The BOV is higher quality than the diverter valves and will exit intake air to the outside instead of putting it back through the turbo system (which will reduce strain on the turbos). This aluminum chargepipe is also much more robust than the stock plastic factory pipe and the connection to the throttle body is stronger, eliminating another failure point of the stock pipe. Oil venting and circulation is a common problem area on the turbocharged N54 and N55 engines. The existing stock system does a very poor job of separating fluid and vapor and this leads to an oily film or even small pools of oil throughout the turbos and intake. We're seeing a lot more 135 and 335 cars with drivability and performance issues because oil has sneaked by the ring seals and is coating the intake piping, intercooler, intake valves, and other critical areas. The problem is worsened with higher boost levels. Oil is excellent for lubricating moving parts but terrible when it gets into the combustion chamber, effectively lowering the octane rating and reducing performance. The oil catch can traps oil as it leaves the valve cover and holds it in a canister. Whatever minimal vapors are left over in the oil is then vented back through the canister and into the intake where it is safe to be burned up in the engine or recirculated back through the system again. At each oil change simply unscrew the canister and empty the trapped oil with your regular used oil. Wagner intercoolers are engineered in Germany to be a superior N54/N55 intercooler than the factory part. With 85% more surface area than the factory IC the Wagner-designed kit is much more efficient. And that helps maintain your boost levels and performance! The factory intercooler is quickly overcome with heat and that leads to a loss of boost and performance. The solution is an intercooler with more capacity for cooling and Wagner has chosen the stepped design to maximize the available surface area in the front end. The best feature of this kit is how easy it is to install (the easiest we have used to date). It's a direct bolt-on replacement for your stock intercooler - no removing the bumper or modifying brackets or wrestling with plumbing. The Cobb Front Mount Intercooler (FMIC) uses an innovative stepped design to maximize the available space in the nose without major modifications for installation. With 60% more surface area than the stock intercooler, the Cobb FMIC delivers much lower intake air temps for more consistent and useable horsepower. Adding any more boost and the stock system is quickly overwhelmed. As the ECU corrects for heat soak you will be losing power, which makes your upgrades worthless. To help maintain boost levels even in the face of elevated turbocharger temperatures, a more efficient intercooler is required. The stepped cooler design uses all of the limited nose area of the E82, E90, and E92 body styles. Cast aluminum end tanks are specially formed to optimize flow (another obstacle for efficiency). Only minor modifications are required for installation and new silicone hoses and clamps are included. Special software is already available direct from Cobb to work with their FMIC via the Cobb Accessport programmer. 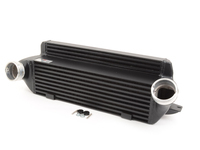 This PWR radiator for the E90/E92 335 and E82 135 is a larger 42mm core (4mm thicker than stock) for additional capacity and bulletproof cooling. It fits in the stock location, with the stock shroud and fan (some plastic trimming may be necessary), maximizing the available space to dedicate to fluid capacity and surface area. Having a greater capacity means less saturation time for the cooling fluid which leads to more consistent engine temperatures, reducing the possibility of limp mode condition and reducing wear and tear on other cooling components such as the water pump and thermostat. If you're looking for the most complete and unbeatable radiator solution for your E9X, this is the best we have seen. OK, it's not the sexiest product to put in a catalog but any mention of 335i performance should include new or spare ignition coils. For some reason, ignition coils on BMWs fail often. They are subject to intense heat and vibration and can be contanimated by oil and dirt. A failed ignition coil (or coils) will lead to a misfire, poor performance and fuel economy, and possibly even a limp mode. With a faulty coil the spark plug is not burning the air/fuel mixture properly and that can lead to problems anywhere in the engine and exhaust (including catalytic converters and O2 sensors). Don't let one of these ruin your day and stay on top of your maintenance! At the very least, carry a few of these with you as spares. Larger sway bars are designed for drivers who desire improved handling without lowering or affecting ride quality. H&R and Turner Sway Bars increase your suspension's roll stiffness ÃÂ its resistance to bodyroll in turns ÃÂ while maintaining ride comfort and dramatically increasing cornering control, lateral stability, and grip. Sway bars act as levers on the suspension and the larger the bar the more force and control it can apply to the suspension. These swaybars have been carefully designed for the E9X non-M chassis to reduce bodyroll and keep the tires in contact with the pavement. A sway bar upgrade is not just for track or autocross - this is an improvement you will feel on your favorite back roads and on/off ramps. A BMW's rear subframe is the heart of the suspension. When the subframe moves, so do all the suspension mounting points. Factor in a lot of additional torque from a tuned motor and the stock subframe mounts become a big weak spot.. Replacing the stock rubber bushings with a stiffer mount limits both drivetrain and suspension movement, eliminating the unwanted changes in alignment and keeping your BMW's setup the way it should be. These solid aluminum mounts are from our racing program but we have had great success using them in highly tuned street cars as well. Since they are a solid mount there is no play or deflection even under extreme loads. And they last forever! Even BMW has seen the benefits of solid mounts and the F10 M5 and F8X M3/M4 come from the factory with them. If you're not interested in solid aluminum we also offer them in Delrin, ultra-stiff rubber, and the stock M3 mounts. All are upgrades over the stock 335i mounts. If you're upgrading the rear sway bar this is the perfect time for subframe mounts as the subframe must be lowered or removed anyway. We have other stock and performance mounts for the 335i! Click here for more 335 mounts. The front upper and lower control arms from the E9X M3 are a direct bolt-in replacement upgrade for the stock parts on the non-M E90/E91/E92/E93 3-series and E82/E88 1-series. With the M3 components the fluid-filled bushings of the standard suspension are replaced with solid rubber cores or a sealed monoball-joint, making the suspension stiffer, more responsive, and longer lasting. These M3 rear guide rod arms are an upgrade for the non-M cars. The stock non-M arms are made from sheetmetal spot welded together at the ends. The arm tends to flex and bend under even moderate cornering loads. Factor in gripper tires and more torque and this arm is inadequate for stability and consistent handling. 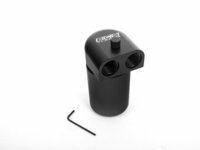 The M3 arms are one piece of aluminum offering greater strength and with a sealed monoball inner bushing that allows the arm to rotate (instead of twisting). These M3 rear upper link arms are an upgrade for the non-M cars. The stock non-M arms are made from sheetmetal and tends to flex and bend under even moderate cornering loads. Factor in gripper tires and more torque and this arm is inadequate for stability and consistent handling. The M3 arms are one piece of aluminum offering greater strength and with a sealed monoball inner bushing that allows the arm to rotate (instead of twisting). StopTech's Big Brakes for the 335i is engineered to work with the stock brake hydraulics and ABS/DSC system. StopTech builds each kit around the specific vehicle, engineering the system to achieve the correct brake balance. This brake upgrade gives better stopping performance in everyday driving, aggressive street driving, or all-out track days. By increasing the rotor size, using a larger pad, and a fixed forged aluminum caliper, you can improve your braking performance substantially for any condition! StopTech Brakes have been used on Turner Motorsport racecars since 2003, winning multiple sports car championships and recording numerous race wins since. We offer multiple types of brake pads to suit your driving needs and expectations. For the street we have OEM replacement, low dust, and performance pads for the E9X 335i. We offer a complete selection so you can get just the right pad for the type of driving you do: daily commuting, sporty or aggressive, back road carving, and more. Street pads should be user-friendly with no noise or vibration. They need to work right away, even at cold temperatures. Street pads generally trade high temperature performance for low temperature performance, which makes them work excellent in street situations but generally do not hold up well over continued track use. See below for brake pads for mixed street/track use and all-out track/HPDE and racing use. "Mixed use" street/track pads are also known as beginner's pads. They are intended for rookie and first-time track drivers who know that their normal street pads will not hold up in prolonged track environments. Using a pad with higher metallic and/or ceramic content will improve its resistance to fade at higher temperatures. Unlike strictly-street pads, mixed-use pads need some heat in them to work effectively. Therefore, they are not the best for regular street use. Metallic pads also tend to squeal and produce large amounts of dust. On the other hand, these are not all-out race pads and some fade on the track may occur. Street-track pads will be fairly easy on rotors and have long life when kept within their operating temps. These generally also work great as an autocross pad. Race pads work in the temperature ranges commonly seen from repeated braking from high speeds on the racetrack. It's the repeated hard braking from very high speeds that requires a very special brake pad. Nearly all street and mixed-use pads will become ineffective at serious track speeds. Racing brake pads are made up of metallic, ceramic, and composite materials that better manage escalating temperatures while also providing exceptional braking performance. Race pads work within a prescribed temperature range (usually in excess of 600*F) - seldom seen on the street. Rotor wear, especially when cold, is significantly more than any other pad. These pads also produce a lot of brake dust which is also corrosive to paint finishes (wheels, fenders, etc). However, when in their temperature ranges, these pads stop better than anything else. Stoptech Stainless Steel Braided Brake Lines provide a quicker, firmer, more consistent pedal response by maintaining consistent brake pressure. Additionally, stainless steel lines provide precision brake modulation, especially during threshold braking. The improvement in pedal feel is more dramatic on older vehicles where the factory rubber line may have softened and swelled due to age. StopTech brake lines consist of a PTFE (commonly referred to as Teflon) inner line that carries the brake fluid, which is then covered with a layer of stainless steel woven braid. The PTFE tube is very resistant to expansion under pressure and will not degrade from exposure to brake fluid. Don't allow your clutch or flywheel let you down! The stock clutch is fine for a stock car or just a simple software upgrade. But anything more and it quickly becomes the weak link (especially with drag races or hard launches). SPEC clutches come in varying stages of capability and use. They have spent considerable time and effort on the 335i models to produce performance clutch and flywheel packages that hold up to track and drag strip demands but are also easy to live with for daily driving. Flywheel upgrades are optional but strongly encouraged as the stock rubber-dampened dual mass flywheel has a tendancy to come apart after lots of tuning and hard use. Upgrading various parts of the differential can have tremendous benefits in your car's performance. It's easy to forget that the differential is a source for making your car faster and handle better so it's often overlooked. The engine is not the only place to make the car faster. For the 335i a limited slip upgrade will be one of the best mods you make. Hands down! Don't waste precious time with wheelspin... Powering both rear wheels will get you out of corners faster. 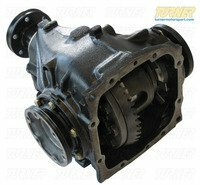 Our differential options vary from gearing upgrades to limited slip conversions. Every custom-built diff is fully rebuilt with seals and bearings. We also design and supply bushing options to reduce driveline wind-up, finned differential covers for better cooling, and more! The traditional multi-plate clutch is the tried-and-true limited-slip design. For highly tuned 335s we like to use a 3-clutch LSD with variable ramp angles that are smoother and quieter than other limited slip designs. The ramp angle determines how quickly the limited slip engages. Response time in the LSD is also quicker, especially compared to the newer M Variable diffs. We also set the lock-up % for the type of driving you do. Whether you're considering a clutch-type, helical, or OS Giken type a limited slip diff is a must-have upgrade on a 335. A turbocharged BMW such as the 135i or 335i needs traction to put that power to the ground. The stock differential of both the 135i and 335i only put power to one wheel -- this just won't cut it! Upgrading to a limited slip differential means power to BOTH wheels, for better launch, acceleration, grip, and track handling. We're excited to be carrying the OS Giken LSD unit in our performance catalog, as we've used their products on our own Championship winning E46 and E92 race cars. Just like the stock subframe mounts, the rubber differential mounts are also subject to extreme deflection and faster wear from higher boost and more torque. Think about it - with more torque comes more twist and rubber will not hold up well under constant twisting motions. When we want to completely eliminate deflection we design a solid aluminum bushing. The advantages of a fully-solid aluminum set is that they last forever, quickens response in the suspension, and frees up horsepower to the wheels. These fully solid aluminum diff mounts are CNC machined and lightened for a direct replacement of the original rubber pieces. These diff mounts are only recommended for serious street, drag, or track cars as the aluminum transfers more noise and vibration to the chassis. UUC's latest offering for the 335i twin-turbo BMWs has resulted in even smoother shifts, a reduction in vibration, and more features! UUC redesigned all of the pivot points of their shift linkage to reduce notchiness. The result is a shifter that is 35% shorter than stock but feels closer to the stock effort. And new internal dampening material doesn't transmit vibration to the shift knob. Simply-put, this is the most complete short shift kit on the market for the 335i. The CP-E downpipes are among the finest crafted turbo downpipes we have seen for the N54 engine. They use a CAM/CAD process, and automated manufacturing, that ensures a tight and precise tolerance for fitment and construction. This attention to detail and craftsmanship will never be found on the cheap auction sites. These pipes are made from 304 stainless steel, 3" diameter at the inlet and then tuned piping down to meet the stock exhaust section. The piping is not only mandrel bent but also features fewer joints and welds than other downpipes that can disrupt flow. These are a direct replacement for the stock downpipe and cat section, including fitment for Xi AWD models. No permanent modifications are made and the upgrade is completely reversible. You retain your factory oxygen sensors. Add a O2 bung kit if you wish to install a wideband sensor on the downpipe. Available with or without high-flow catalytic converters. Running without cats will have the least restriction and result in more power. Sport cats are available to provide a cleaner exhaust gas and less noxious smells and fumes. This Corsa exhaust for the E90, E92 335i and 335xi is a full cat-back system in a super large 3.5" tubing diameter. 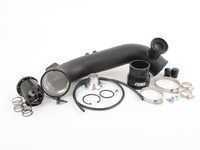 With a turbo engine like the N54 and N55 larger piping in the exhaust helps the turbo to push exhaust gases. The turbos become more efficient and are working less hard which helps with their longevity. The Corsa cat-back flows 35% better than the stock system! And a noticeable power boost comes with it too! Supersprint produces modular exhaust designs that let you configure your own system. They are one of the very few companies that builds a complete exhaust from the engine to the bumper and tests each section for optimal horsepower gains and a great sound. For the E90/E92 335i models they have turbo downpipes, front sport catalytic converters, rear x-pipes, and several styles of rear mufflers on offer. Even at a premium price Supersprint is an unbeatable exhaust system because every aspect is done to such a high level. Most Supersprint systems are built with larger diameter piping to improve exhaust flow which helps the engine do less work and make more horsepower! Borla produces two distinct exhaust systems for the E90/E92 335i: Touring and Aggressive. The Borla Touring exhaust is geared for an enthusiast who wants to hear more of the engine but wants to avoid an excessively loud and intrusive sound. The Touring exhaust produces a muted growl that you can appreciate but not have to compete with when you want to talk to other passengers or listen to the radio. Borla builds this exhaust as a true cat-back system, eliminating the center resonator for more volume and using a large rear muffler for a tuned exhaust note. The Borla 'Aggressive' system is also a cat-back system with an x-pipe section to replace the resonator, and dual rear mufflers. This system was Borla's response to a demand for greater volume for the 335. The turbos make the car quieter so having a performance exhaust will allow you to finally hear the engine. Borla has tuned this exhaust to give more of a throaty burble, especially at low RPM while maintaining acceptable sound levels for daily street use. The Aggressive system is also a lot lighter than the factory system; less weight = more performance! This Akrapovic Evolution exhaust improves upon the stock exhaust system of the BMW 335i in numerous areas. The first visible improvement is the additional power and torque. The range between 2.000 rpm and 3.000 rpm and at 3.500 rpm was particularly improved. A noticeable improvement can also be observed at high RPM where the Evolution gives more power. When trying to achieve better performance, weight also plays a big role. The Akrapovic exhaust system for the BMW 335i is over 50% lighter than the stock exhaust,, which gives it an even better power to weight ratio. This beautiful piece of titanium art also gives the powerful BMW 6-cylinder engine a more sporty sound. APEX Wheels are the perfect complement to your BMW. Their designs are inspired by classic motorsport wheels of the past but with a fresh approach to manufacturing and customer support. APEX offers more wheel sizes, offset, and color combinations than any other wheel brand that we carry. And they are all exceptional quality. APEX uses the flow-forming manufacturing that produces a strong but light weight wheel. As well as being pleasing to the eye these are very strong and functional wheels that are at home on the street as well as the racetrack. The design is based on classic motorsport themes that blend with BMW styling and appearance. Multiple color and profile options allow you to set just the right look and stance for your car. D-Force Wheels has been one of the leading innovators in flow-formed alloy wheels for the BMW market. Flow-forming is a process that results in a stronger wheel than the traditional casting process and less weight than a traditional forged wheel. Many high-quality and OEM wheel manufacturers are moving to this flow forming process. D-Force first gained credibility and fame with BMW CCA Club Racers throughout North America. A light weight, strong, and affordable race wheel proved to be a winning combination. D-Force Wheels are available in two distinct styles: LTW5 - light weight 5-spoke in 17" and 18" sizes and EmPower - light weight multi-spoke 'mesh' style wheel in an 18" size. Whether you are tracking, racing, showing, or just going Forgeline has a beautiful forged alloy wheel to meet your needs. Forgeline Wheels has been in business for over twenty years with a solid reputation for quality and design. Forgeline produces 1-piece and 3-piece wheels that are built especially for you. Every wheel starts with your personal style and expression. The sizing, offset, colors, and finish come from you. Choose from standard colors or custom paint; brushed, matte, polished, or satin finishes; or just about any combination throughout, including factory paint matching. Turner Motorsport has been working with Forgeline since 1997 and share their commitment to customer satisfaction, quality, and that perfect fit. We use Forgeline on our own street, race, and project cars. Contact us for any Forgeline or custom wheel needs. When it comes to all-out cornering performance, one rule applies: wider is really, truly better. Wheel spacers let you balance the handling and performance of your car to suit your aggressive driving style. Most manufacturers, even Porsche and BMW, leave 20 to 30mm of extra space between the tire and the fender to suit arcane regulations or to leave space for flapping tire chains. These light-alloy spacers push your existing wheels or even your hot, aftermarket alloys out to fill the wheelwells properly, giving you better cornering, better aerodynamics and even better looks. Turner Motorsport may be the biggest BMW wheel spacer retailer on the planet. We design and manufacture our own spacers as well as those from H&R Springs. 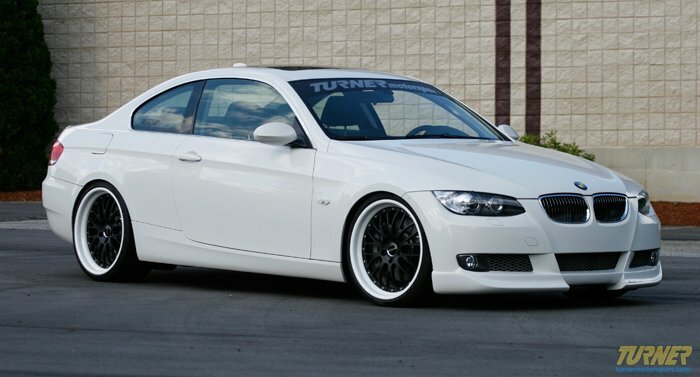 Turner Motorsport Wheel Spacers - Click here for more info. H&R Wheel Spacers - Click here for more info. The P3Cars Vent Integrated Digital Interface (vidi) is the data display you've always wanted. It simply plugs in to the OBD communication port - no modifications or re-wiring needed at all! Pop out your stock air vent, run the data cables through the dash, plug in the cable, reinstall the vent with the new display and you're done! The P3 gauge reads and interprets data available from the OBD port and displays it in realtime. To read boost on N54 turbo engines, run a line to an existing vacuum line and connect (t-connector and line included). Data that was previously only available with advanced factory diagnostic tools is now literally at your fingertips. Use the data stream to evaluate your engine performance, acceleration and braking improvements from modifications, cooling system performance, battery condition, and more. You can record and play back 15 seconds of data for analysis. It also works as a diagnostic trouble code display and has a clear function for resetting the codes. The whole kit is installed in the original left-side air vent housing. You can order it two ways - the basic display for a DIY install in your original vent (easy!) or pre-installed in a new OE BMW vent (easier!). When you run the cables through the dash and install the vent housing there is no trace of the P3 gauge's aftermarket installation. It's so well-integrated that it looks like a BMW part. It's color-matched to your existing gauges and has a manual dimmer or tap into an existing source to join the dash's auto-dimmer. Chrome is so Seventies!!! These replacement front grilles eliminate the traditional (but dated) chrome BMW kidney / center grilles in favor of the stealthier look of matte black or carbon fiber. These shadow-style pieces feature factory-style clips and installation. Blackline grilles give your BMW a darker, more aggressive look without being over done. They are made from impact resistant long life ABS polymer. These install in minutes, and cost less than the cost of a pair of new factory BMW grilles, making them simple and cost effective. Each kit includes both a left and right grille for your BMW, ready to install. Click here to see black grilles for your 335i. Help your BMW stand out from the crowd with our colored Roundel emblem covers. Whether you are looking to match your paint color, hightlight your interest in motorsports, or freshen the look of your car, Roundel decals offer a great way to personalize your BMW. These easy to install vinyl decals adhere over the existing Roundel emblems. The kit includes colored quadrants to cover the hood emblem, trunk emblem, steering wheel and 4 wheel emblems. These are made to withstand all weather conditions and are removed with ease if required. Is your BMW's emblem faded, chipped, peeling or even MISSING? A new hood or trunk badge is an easy and inexpensive way to treat your BMW and spruce up its looks. Best of all, it takes only minutes to change! Whether you are just looking to replace your stock emblem or enhance the look of your emblem with our colored/carbon fiber roundel overlays, we have just the right part for you. We love the look of the new 3 series. But the large orange reflectors on the front wheel arches HAVE TO GO! These professionally painted reflectors replace the ugly orange reflectors with PERFECTLY COLOR MATCHED pieces so that they blend in perfectly with your bumper. Simply remove your stock orange reflectors, and install these painted reflectors. Professional 3M adhesive makes installation a breeze, as well as insures these will be installed securely. These particular reflectors are for the 2007 and newer 3 series coupe (E92) and convertible (E93). These can be used on all non-M 2007, 2008, 2009 and newer 335i, 335xi, 328i, and 328xi. We carry several license plate frames and accessories to dress up the front or rear of your 335i. We sell the Genuine BMW plate frames as well as carbon fiber and others. We also offer several license plate brackets that are the best alternative to drilling holes in your front bumper. The No Holes plate brackets screw into an existing attachment point on the tow hook and preserve the paint and bodywork of your BMW.